You made your first class debut for Windward Islands in 1997.You did not play for another five years. Why the long hiatus? I made my debut for Windwards in ’97 and then I moved to Antigua, which is the island where I lived and worked as a policeman. I lived there for 10 years and I didn’t stop playing. I continued playing for Antigua all those years. I guess the time wasn’t right when I started in 1997. The time wasn’t right for me to play first class cricket. When I moved to Antigua, I took my time, never stopped playing, continued training and enjoying it. The time came somewhere in 2001-02, when I started playing for Antigua again in first class cricket. You had a brief stint with the West Indies team. Came to the West Indian team around 2002, played 11 tests over a three year period and faded away quickly. Why such a short span and why were you out of the scene so quickly? There are certain things, I know I can say and certain things I cannot. I guess whatever reasons the West Indies cricket board had or the selectors had, they thought that I couldn’t do it anymore. I guess that’s what happened. You go out there, you put in your hard work, and you just hope for the best. I did that for a few years to the best of my ability. I honestly don’t know, I can’t say. All I can say is I did my best for WestIndies cricket in my limited career. Share some thoughts on your debut series against India. How was the whole experience playing Test cricket at the top level with the Laras and the Hoopers, how did you feel about that? It feels good you know. In the Caribbean it’s one thing, especially if you are playing a sport like cricket. It’s one thing you always want to do, is to represent the West Indies at the highest level. Playing with the the Laras, Chanderpauls and the Hoopers, all these guys were my heroes. It’s something that you really cherish. It’s something you wanted to do all your life. Do you think you could have played a little longer if you played more one day cricket? There were some selection policies at that time where some people were only playing ODI cricket while I was playing only Tests. It’s something you really question about, like what’s the qualification, what makes you a Test player and what makes you an ODI player. West Indies selectors never said, “You know what, we don’t want you for ODI’s”. There really were no benchmarks. Yes I could have benefited from ODI’s but we would never know. You bowled to both Sachin Tendulkar and Brian Lara, How difficult was it as a bowler to bowl to legends like them? What was the thought process as a bowler when you bowl to such gifted players? The truth is I never thought about it. They have the experience, they have the exposure, and they do what they have to do. You got to believe in yourself that I’ve got this opportunity and there’s a reason I am here. I can do what they select me to do. I never feared bowling to any of them. It’s always a challenge. At the end of the day, you got to be able to rise to the occasion whether you are bowling to Brian Lara or Tendulkar. It’s all about believing in you. I have that strong belief. I believe that I can do it. I went out there, did my best and that’s it. What was the drive for you to move to the United States and continue playing here? The truth is, when I left the Caribbean, I honestly gave up on cricket. I had an injury during a first class match. At one point in my career, I had given myself one chance to play, a chance to give it back to the West Indies and if that doesn’t happen, I was going to give up on cricket back then, and concentrate on what I used to do, which is policing. But then God had different plans for me. He had a plan that I would be up here with my present wife. I am thankful every day for her for giving me support, playing over here. She knew I gave it up back home. When I came up here, the wife is like, “Come on Sanford, you can still do it. Why don’t you do it?” She is the driving force behind me, encouraging me and pushing me, “Yes you can,” and gave me support pretty much. You seem a pretty fit individual for your age. What keeps you motivated really for someone who has played at the highest level? You are just playing recreational leagues and Sunday cricket. How do you keep going? I would like to think God is one that keeps me going. I believe He is the one that gives you the strength, and help you to go through. With the support of my wife and the few friends I have around, and the love of the game. If you don’t love something you won’t enjoy doing it. It becomes like, I am just doing it, but I don’t love it anymore. I still love cricket. 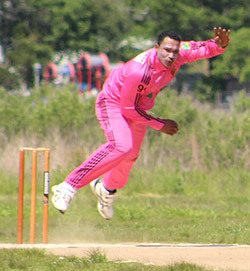 I have the passion for cricket. I think this is what keeps me going. What do you think about cricket in the USA? What do you think can be done to improve US cricket at an associate level? Cricket in the US has the potential. The players are there, but one of the things I personally would like to see, is getting the younger players involved. You want to win, but you want to look forward to develop the sport. You want to look to the future. You don’t want to win just to say, “I want to win now,” when you get a few players good now to make you win now, and then the next two years, these players are gone. What you want to do is have a structure in place where you have a few U-19 players coming up. You train them, you do what you have to do, and hopefully these people will work for a purpose and the next 5-10 years you can represent US and take them to the next level. If you intend to have players that can only last 2-3 years, you are really not planning for the future. I think it’s one of the problems, I could be wrong, but that’s what I think. What were your best and worst moments in your playing career? Honestly I can’t think of a worst point. I had a low point though. I think one of my lowest points in playing ball for West Indies was in South Africa when I got struck off the team list 11 minutes before they started the game and my name was scratched off. That was one of the lowest. At the end of the day it’s an experience. You live with it, you get over it and you move on. I think one of my best moments, was to get Sachin Tendulkar out first ball. I still cherish the moment when I surprised myself. I think that was one of the highlights. Yea me too. This is a bit of a let down tbh. Good interview. Anyone remember seeing him bowl back then? Have no idea why but when I read the thread tittle I read it as Allen Stanford………..thought it was gonna be a massive piss take. I met him at the Unity Cup in Chicago earlier this year. I was amazed how fit he is and how much firepower he still had with the ball. Really nice guy to boot.